This month's Lawn Fawn inspiration week is winding down, with all new products hitting the stores tomorrow! 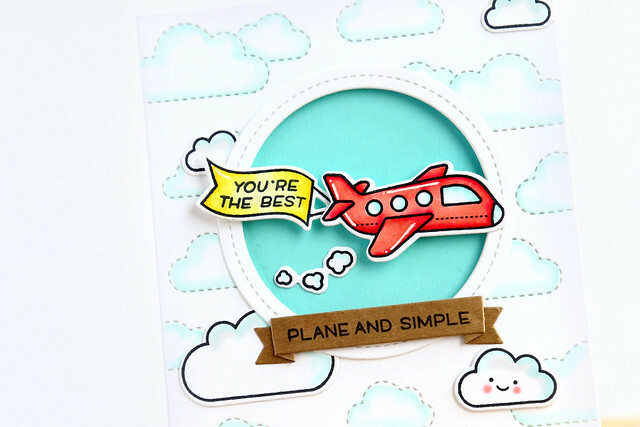 Today, we're showing off the Stitched Cloud Backdrops, perfect for adding subtle sky detail to your card-fronts. I couldn't help but pair the cover-plate with another new set, Plane and Simple. 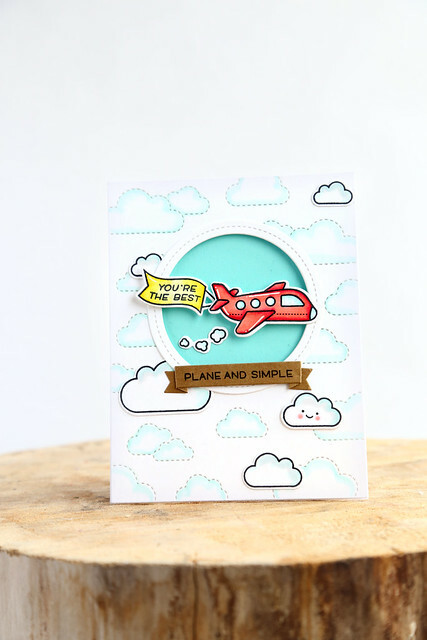 The circle frame was perfect for highlighting the plane, and I added some simple coloring to the clouds in the background. The one smiling cloud is so cute. I had to add a smiley face in there! This is my second post for the day. Scroll down or click *HERE* to see my Lawn Fawn project. Is this not the cutest image? I love it so much. 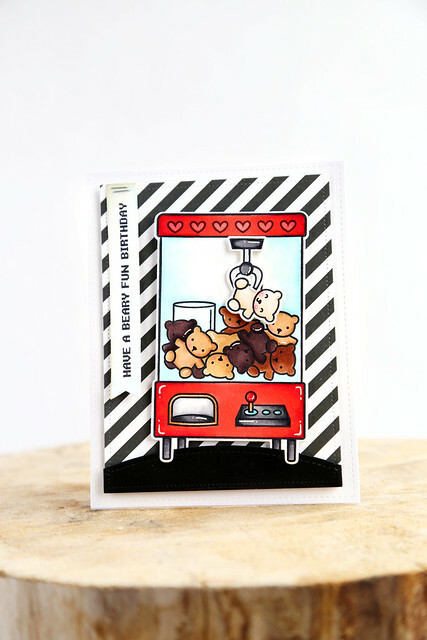 I also used the new Horizontal Stripes die, and I like how it covers the entire card-base but leaves room for the main image. perf. 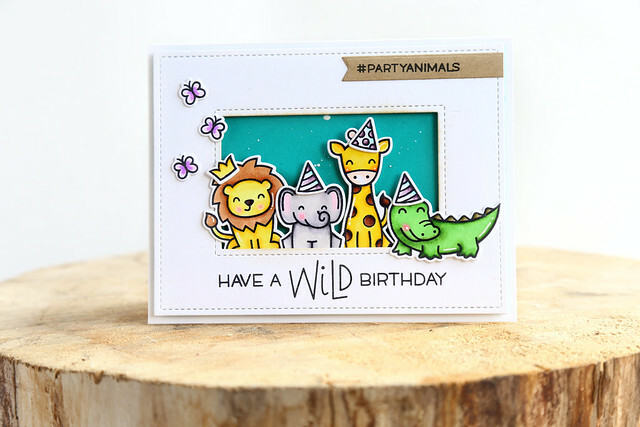 Today, the Lawn Fawn team is showing off Wild For You, a fun set featuring wild critters and birthday hats and a slew of sentiments for different occasions. I used one of the new Outside In Stitched Rectangle Stackables dies to make a chunky frame for my critters. 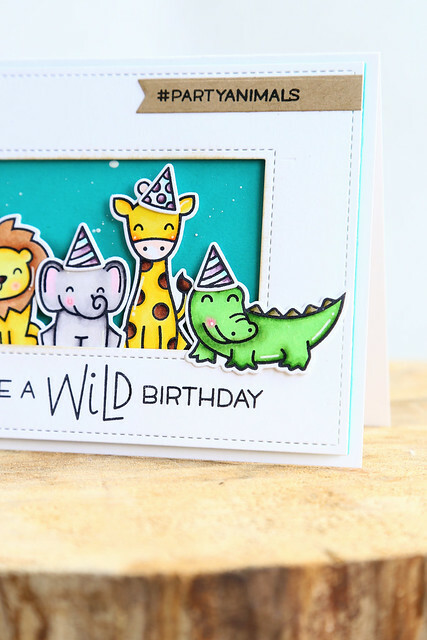 I backed it in a saturated teal cardstock so that the animals would really pop. To show different levels of interest, I placed the first 3 critters inside the frame, and kept the alligator (my fave) outside. I also added a little hashtag banner to the top and balanced it out with some butterflies on the left. I hope you like it! 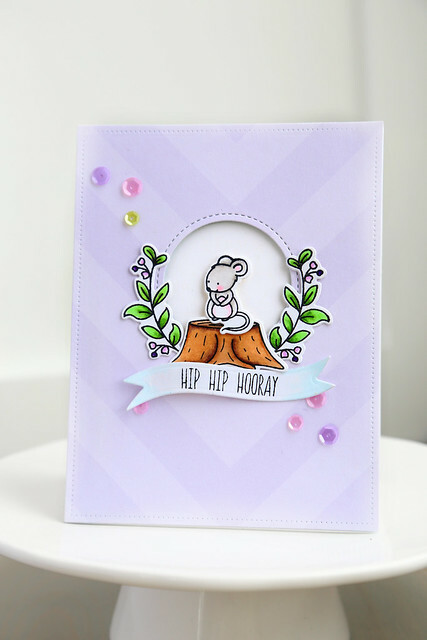 Kelly Marie re-created this card in her video today, but bumped it up and turned it into a shaker card. Check it out - click! 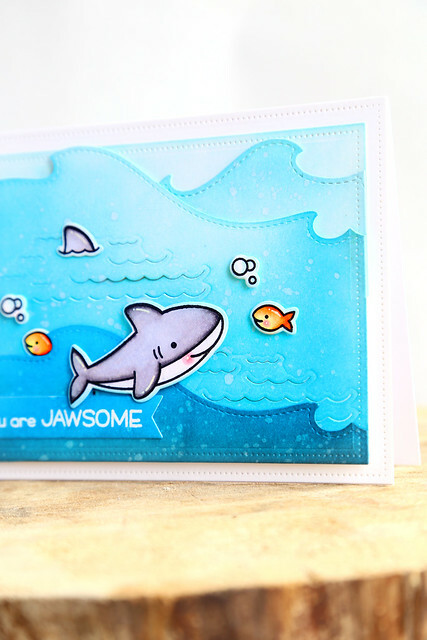 We're showing off the cute little set, Duh-nuh, today which I paired with Ocean Wave Accents and Ocean Hillside Pop-up Add On dies to create an underwater scene. I did a partial die-cut of the ocean wave so that I could have one really tall panel for the little wave accents. The panels were colored with distress inks. I sponged a darker blue, and even some Black Soot ink to the lowest panel, and worked up to the lightest blue (Tumbled Glass) at the top. I then flicked a bit of water onto all three panels to give some extra interest. Hi there! 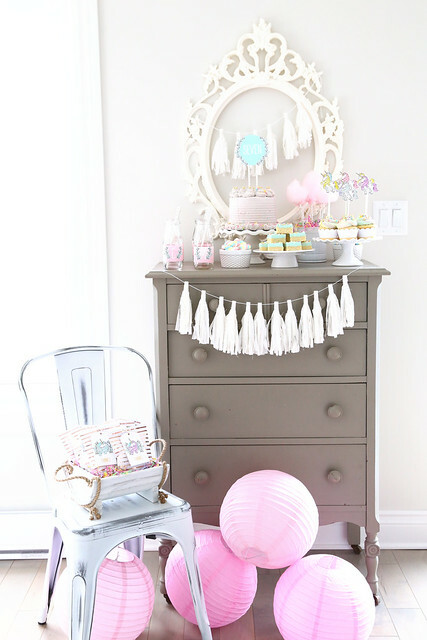 Happy Mother's Day, and welcome back to another day of this month's Lawn Fawn inspiration week. I hosted our Mother's Day brunch yesterday and somehow got distracted by yummy waffles. Sorry I missed posting my card! I'm making up for it by posting yesterday's and today's cards in one go. Today's showcase features the new set, You're Clawsome. I just love this set! It is so fun and innovative and the kids went bananas for it when they first saw it. I colored the machine in a bright red, and set it on top of a graphic black and white striped background. The bears were colored in shades of brown with the lightest one being snatched out. 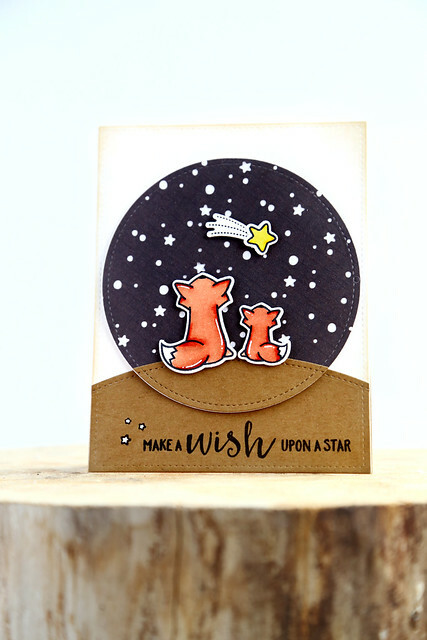 Yesterday's reveal featured star-gazing critters in Upon A Star. I decided to forgo stamping the constellations in the set, and just used the Snowy Backdrop cover plate instead. One shooting star gave them something to wish on. The card design is simple, but so sweet. 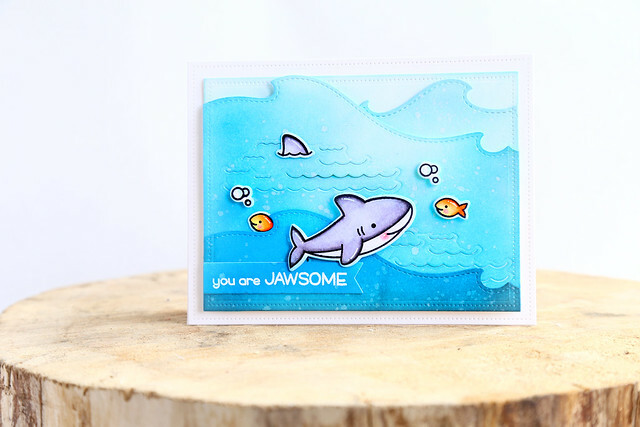 Welcome back to another day of Lawn Fawn's inspiration and summer release week! 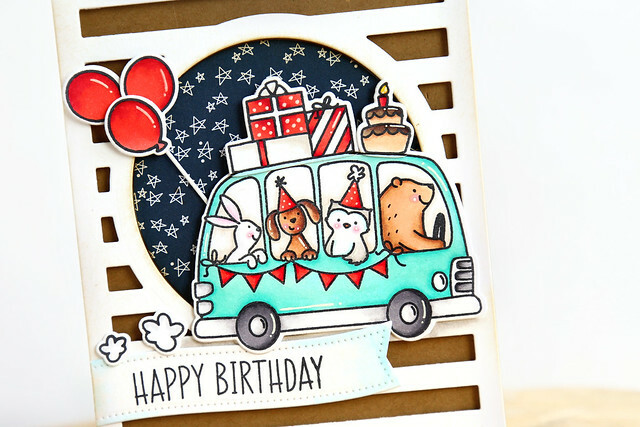 Today, we're showing off a very cool new die: the Magic Color Slider. Everything is black and white... until you pull the slider to reveal a colorful scene! I used Dad + Me to show a straight-laced dad hanging with his kid. Definitely not. Those joke glasses are hilarious. 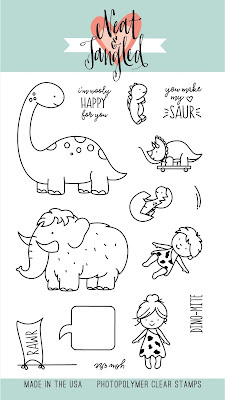 - use Staz-on ink for stamping on the acetate. 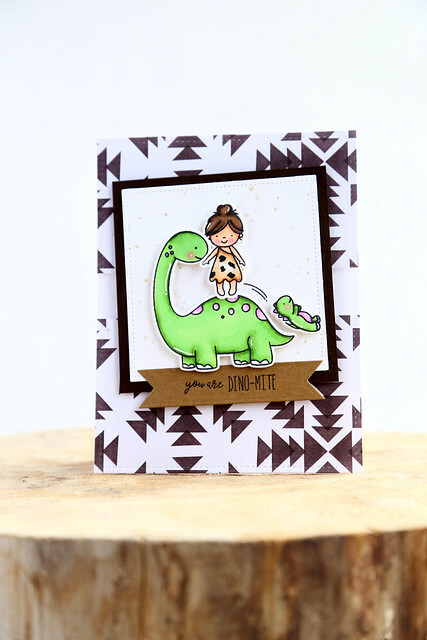 - a stamp positioning tool (like the MISTI) is a huge help. I wanted a good impression on the acetate and it took 2 or 3 inkings to get that. - think of fun things that could be added as the slider pulls back. I did that with joke glasses on this card! - saturate your colorful background. In hindsight, I wish I had done that. When you pull back the slider tab, the wow factor is revealing a completely colorful panel and I kept mine too light. I will definitely be making another one very soon! 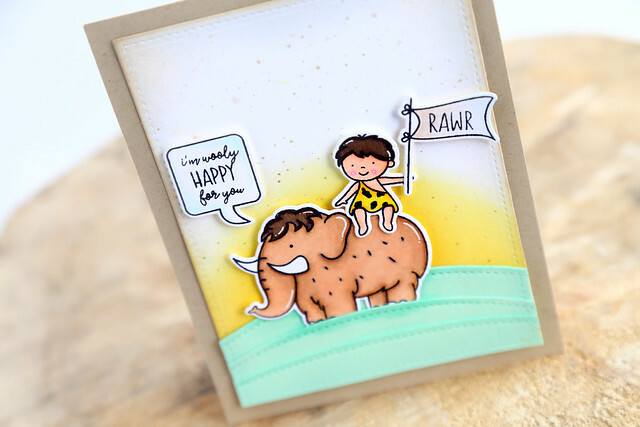 Check out the rest of the design team's slider cards on the LF blog this morning - click! 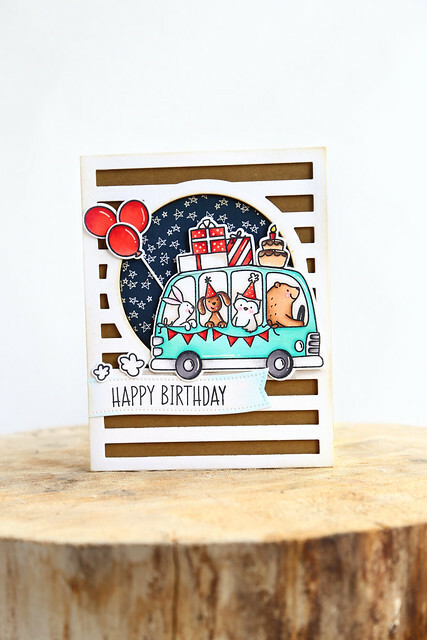 Lawn Fawn's summer release is being shown on the blog alllll week and you are gonna want to check it out. It was like Christmas in May when I opened my box of new goodies. The summer release will be available for purchase as of May 18th. 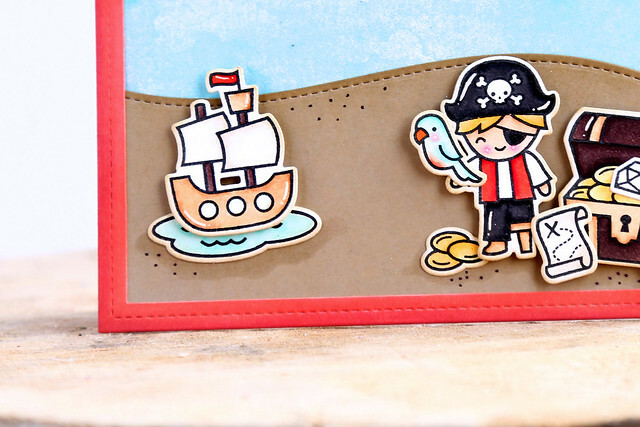 We're kicking things off with a look at Ahoy, Matey. 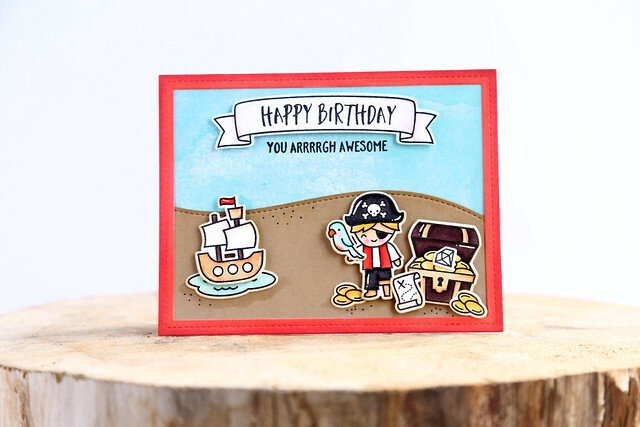 I made a sky out of Watercolor Wishes paper, and a kraft hillside for the pirate to bury his treasure in. Or find it. That probably makes more sense. 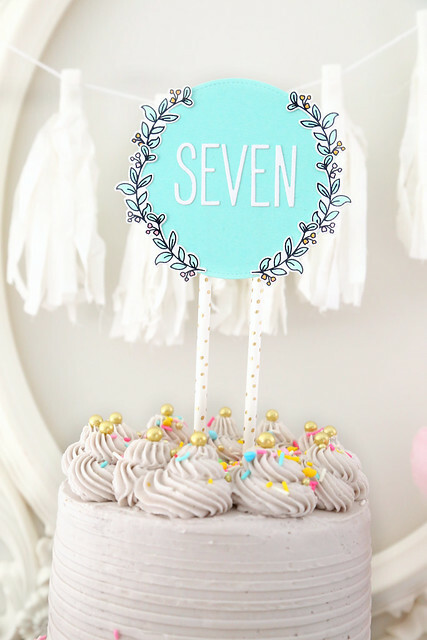 The Happy Birthday sentiment fits perfectly into a Bannertastic banner. The little pirate is so cute with his peg leg. And the tiny puddle as a parking spot for the ship is cracking me up. 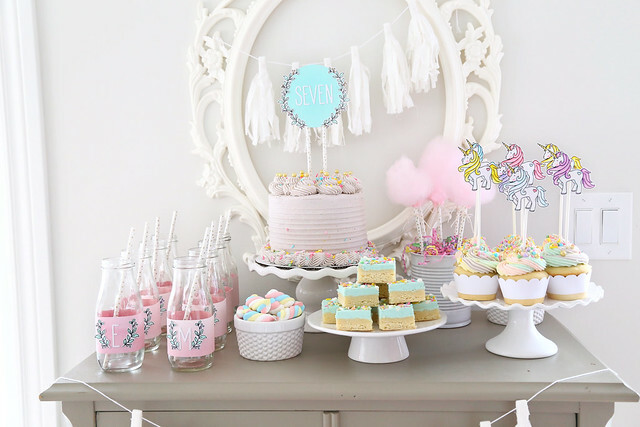 Maia turned 7 last week and we celebrated in magical unicorn style this past weekend. 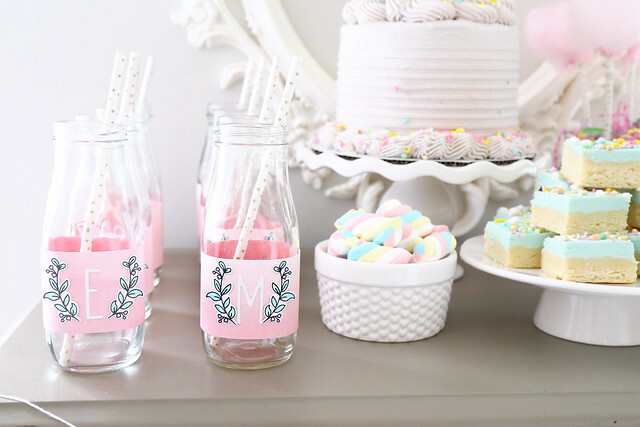 My pastel-loving heart was so happy to craft and bake for this little party. 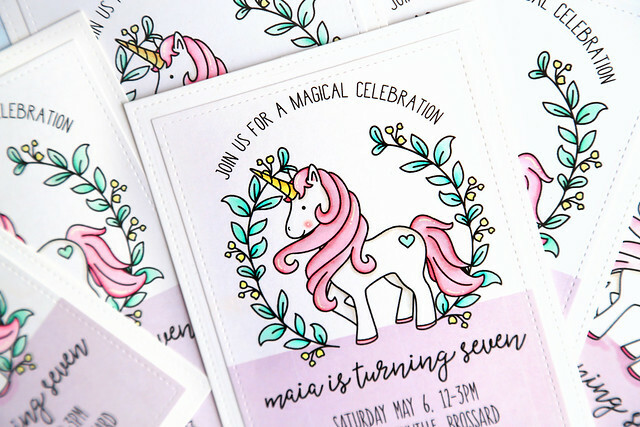 I used the unicorn stamp set, Magical Day, from Neat and Tangled to create all of the party decor. I also baked up all of the treats. This cake was so yummy. A confetti cake with strawberry cream filling (both were recipes from the Layered cookbook) and my own favorite vanilla buttercream. 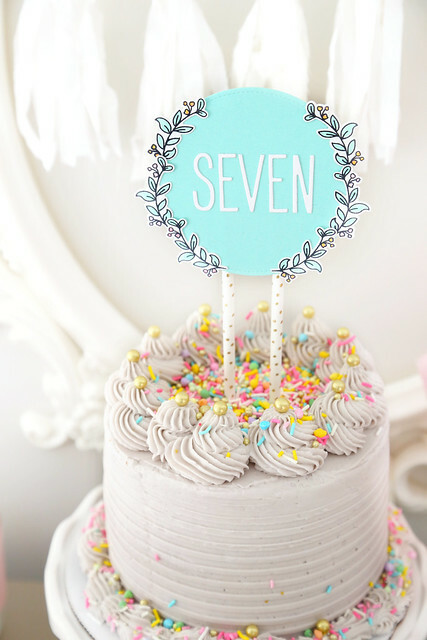 I used the sprinkles (a splurge, from Sweetapolita's shop) to cover everything. They are so dreamy! I had a few suggestions to try rainbow-icing for the top of the cupcakes, and I'm so glad I listened! It was my first time attempting this and now I want to multicolor the top of every cupcake! It was so fun to watch all the colors swirl out. 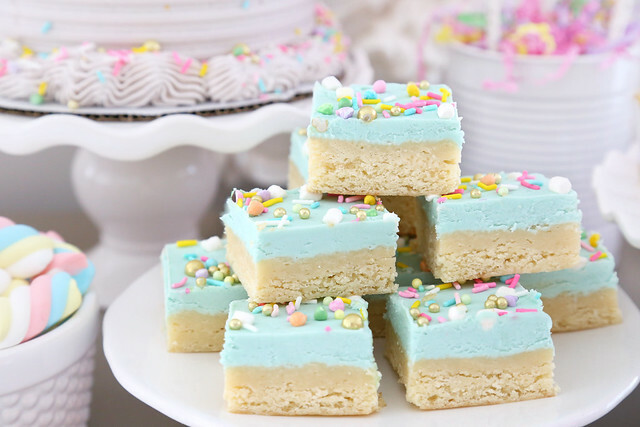 The last baked item were these sugar cookie bars, covered in marshmallow buttercream icing and more sprinkles. So good. 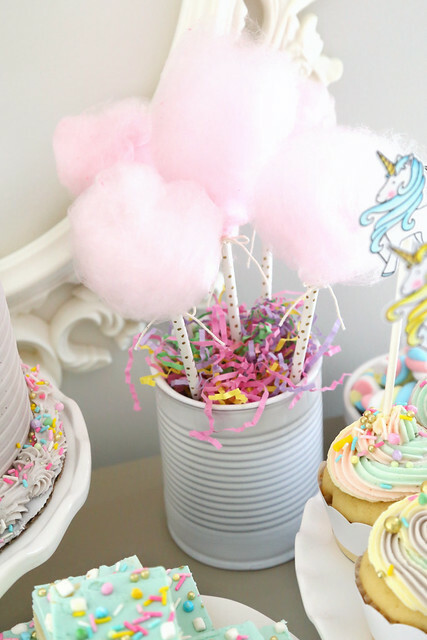 And, we broke out our rarely-used cotton candy machine for the occasion. I put those little fluffy bundles on display and snapped a quick picture but they oxidize and turn to shrivelled lumps pretty fast. 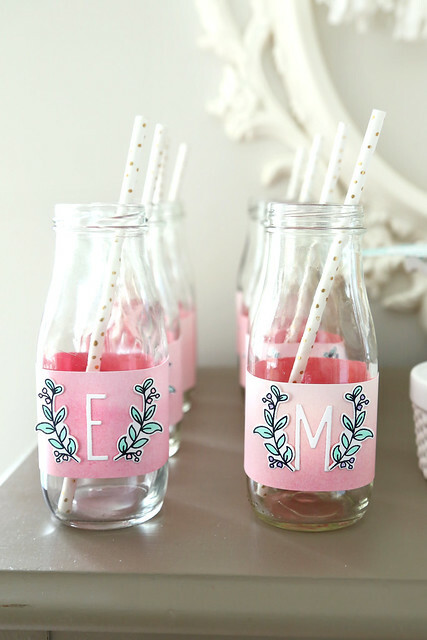 We made a few batches with the party girls as an activity and it was a hit. The first to arrive was Maia's cousin, Lauren (because we all live on the same street!) I thought it was a sweet opportunity to snap a picture of the 2 of them together. 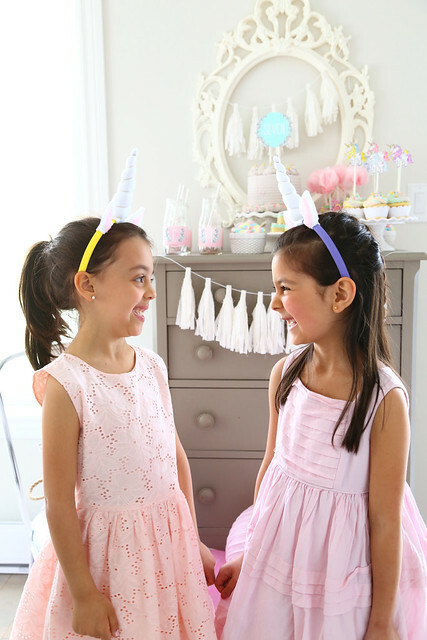 I made all of the girls unicorn horn headbands, and I loved seeing them enjoy them! That face! 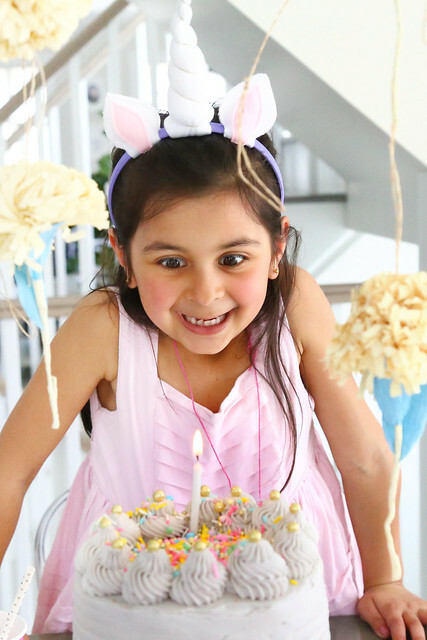 One day I'll provide a montage of all the times she looked at cake that way, and it will play for an hour. haha. On the way out, the girls grabbed a little gift bag and I slept for 10 hours straight. It's Neat and Tangled release day! You can find all of the new products in the store right now: CLICK. I have a few more projects to share with you. The tree stump is from Lumberjack Love and the sentiment is from Big Top Birthday. 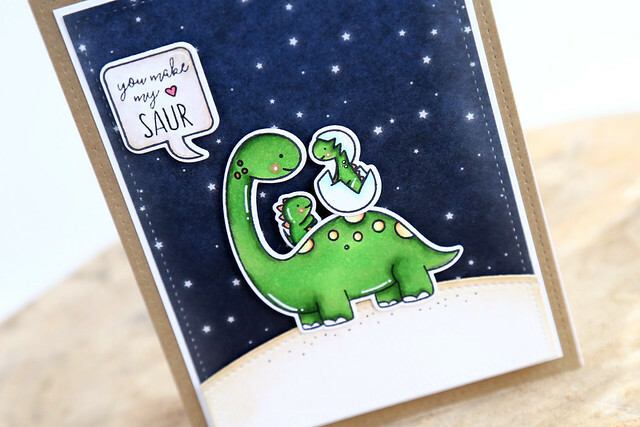 I also have one last dinosaur card to show you - I am really have fun with Prehistoric! 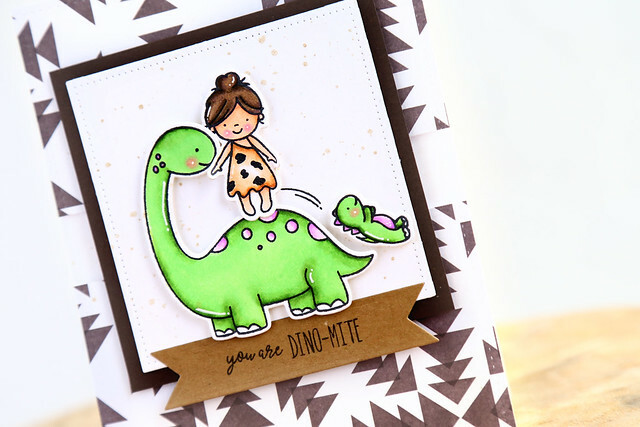 I love that little dinosaur sliding down the mama's tail! Thanks for stopping by, and happy shopping in the NT store! Hi there, and welcome back to another day of new Neat and Tangled reveals. Before I show off today's set, I just want to shout a huge "thanks!" for all of your sweet comments on Prehistoric yesterday. You made my day! 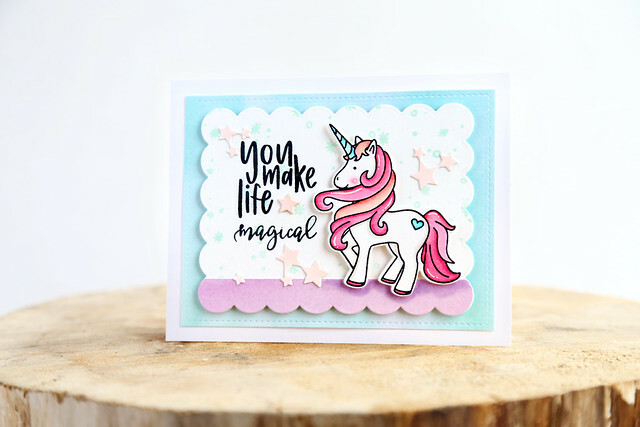 I stamped the starry Fairy Dust background in a light blue ink, and stamped out the sentiment in a graphic black. 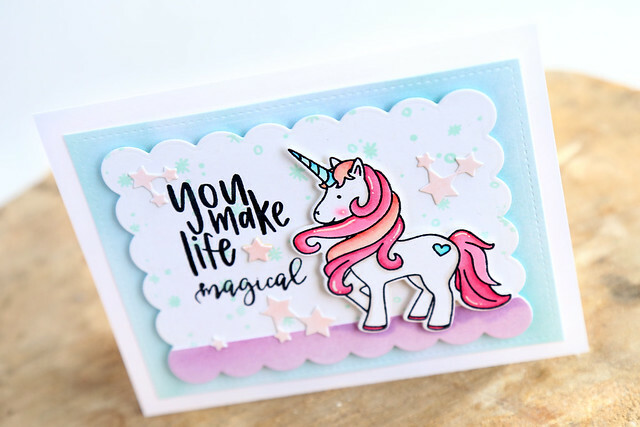 I opted to use the word "magical" from the unicorn set, but there is a bigger version of that same word in Fairy Dust. I just thought it fit better around the unicorn. 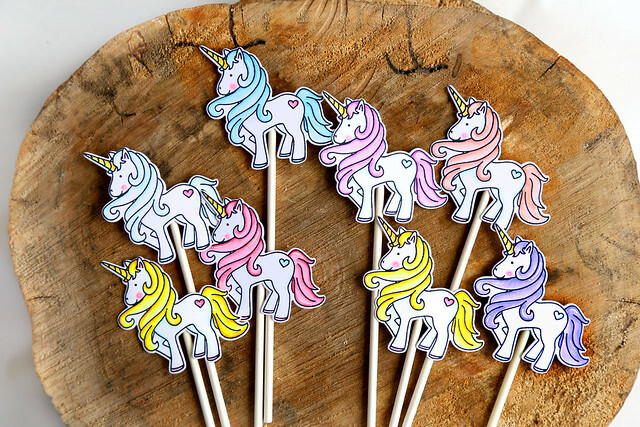 I colored the unicorn's mane in shades of pink, and the horn in shades of blue. 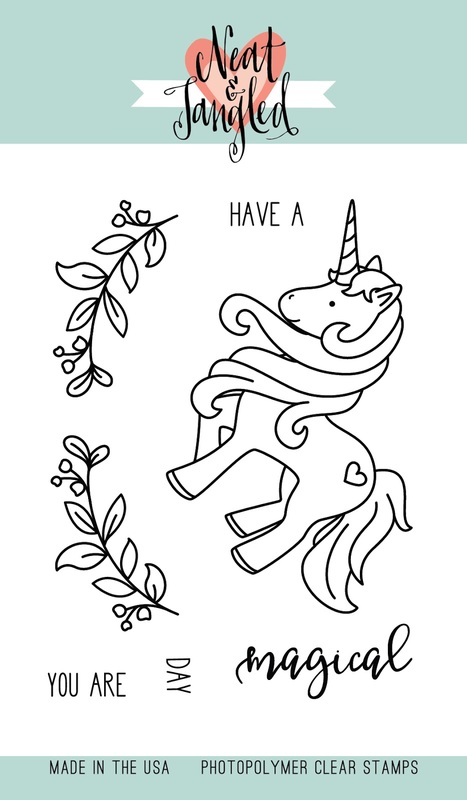 I've colored at least 20 unicorns and I still want to color more! So much fun. I adore how large the image is. It fills up a card front so perfectly. Welcome back to another day of this month's Neat and Tangled release week. All new products will be available for purchase in the NT store as of 8am EST this Friday! I had so much fun creating this set, and playing with it to make samples! 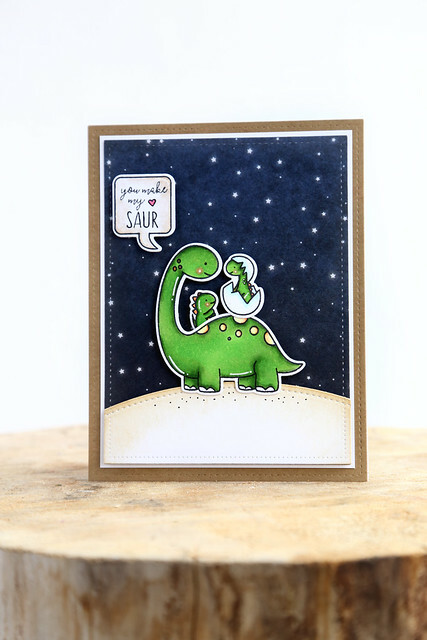 My first card shows the dinosaurs together. I love the mommy and baby looking at each other for the first time! and the other little dino (who is meant to slide off the mommy's tail) looks so cute tucked into the scene. I love the hatchling dinosaur! I die-cut a trio of minty green hills (dies are by Lawn Fawn) and did some yellow ink-blending coming up from behind. Let me know what you think of Prehistoric! You could win a 25$ gift card to the Neat and Tangled store. 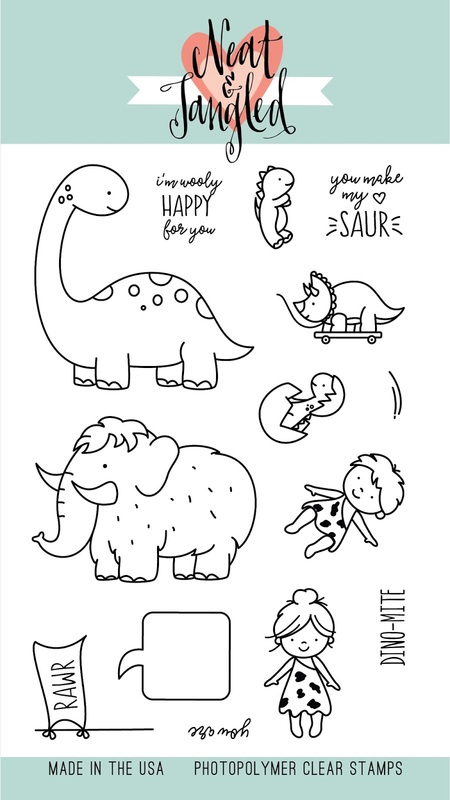 Then, click over to the NT blog for more Prehistoric inspiration, and leave a comment there for a chance to win your own Prehistoric set. Welcome back to the second day of Neat and Tangled's May release week. You are in for a treat today. Miriam Prantner designed a must-have set, called Art Deco. I plan on using this to make my Christmas cards next year. It is so perfect. For now, I used it to make a card for my cousin's summer wedding. 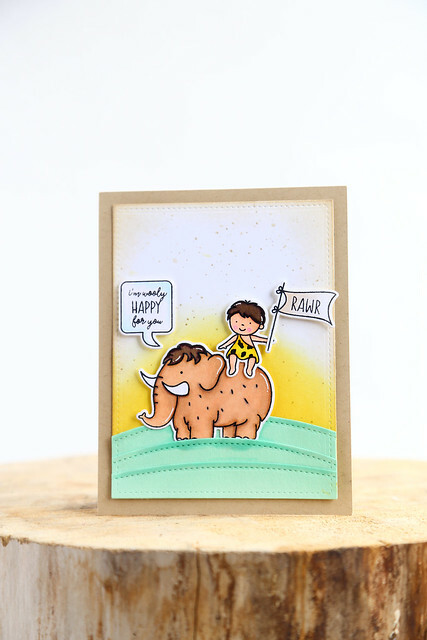 I started out by stamping and heat-embossing the Art Deco background in clear embossing powder. Then, I used 2 shades of purple distress inks to color the background. It's alway so much fun to watch the heat-embossed image pop! I also heat-embossed the sentiment, in silver. I hope you like it! Check out the NT blog this morning for more Art Deco inspiration and your chance to win a copy of this stunning stamp set - click! It's the first day of Neat and Tangled's May release week (did you miss us in April? i did. insert sad face.) We're making up for it this month with amazing new stuff. Seriously, I love everything we have to offer! To kick things off, I designed a 3x4 unicorn set. Magical Day was made on the request of my soon-to-be-seven-year-old Maia. 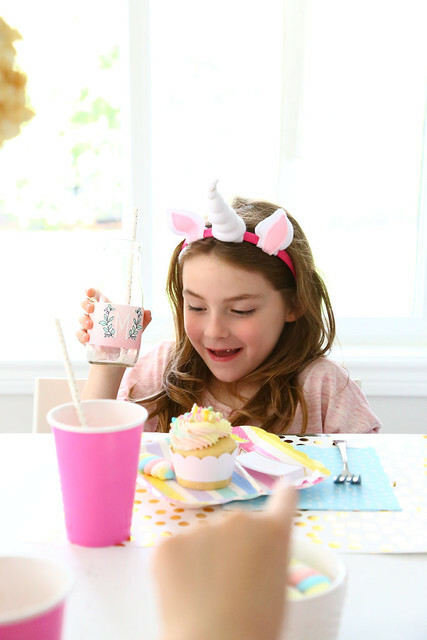 She desperately wanted a unicorn birthday party but none of the unicorn sets out there were quite what she was looking for. She asked me to make a unicorn with "hair coming to the front." I had to get approval from both Danielle (owner of Neat and Tangled) and Maia. ha. I included some delicate sprigs that could be used to frame the unicorn. I love that they could be used to frame any woodland image too, or be built up into a wreath. I will be using those images a ton. 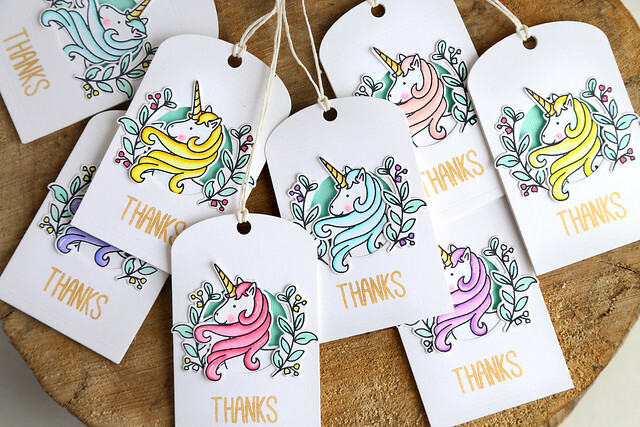 I used our Classic Tag 1 die to make thank you tags. I cut a circle into a top tag layer, and popped it up onto a minty tag layer. Into the opening, I slid the unicorn (I cut around the mane so that it would spill outside the frame) and added sprigs on either side. 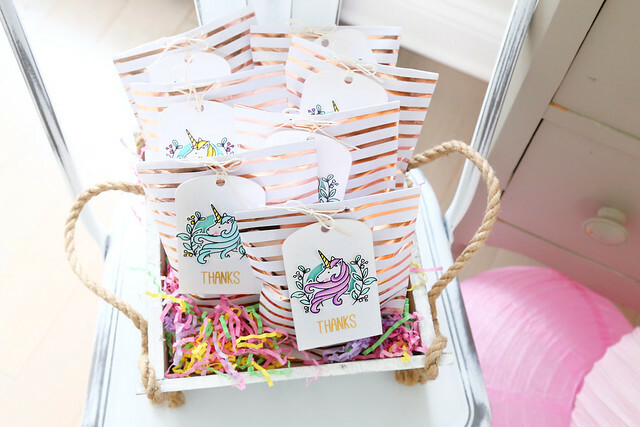 The simple greeting is from Itty Bitty Welcoming Committee and was stamped in gold ink. 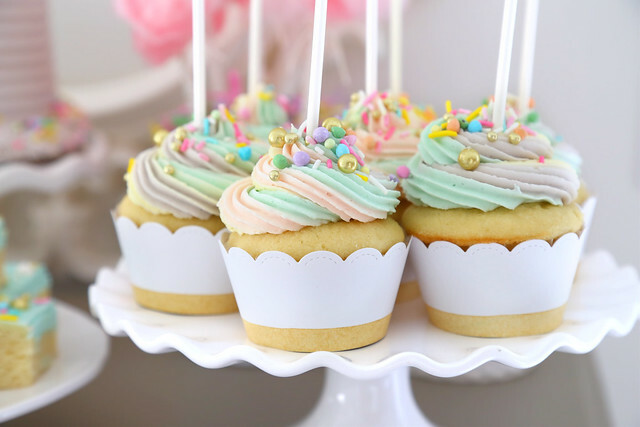 I also made a set of simple cupcake toppers. 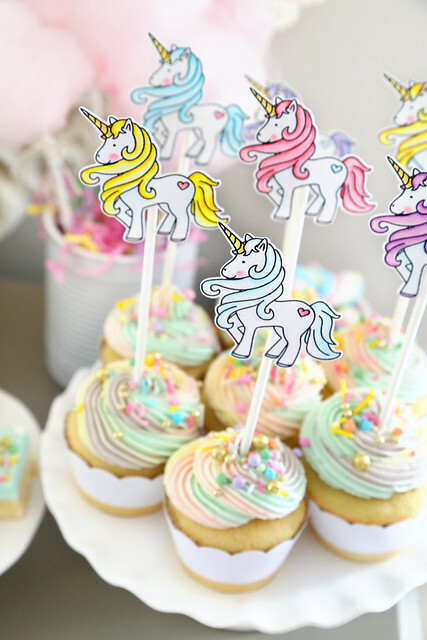 I bought a set of striped paper plates in a rainbow of pastel colors and I colored the unicorn manes to match. With all of these rainbow colors, I'm not sure what color to dye my frosting. Any suggestions? 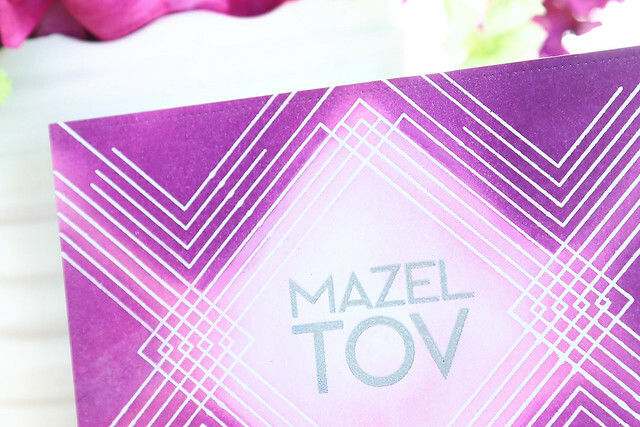 Finally, here is a peek at the invitations I sent out. I stamped the unicorn, masked it, and stamped sprigs on each side. I doubled-up on the sprigs to create a fuller wreath. 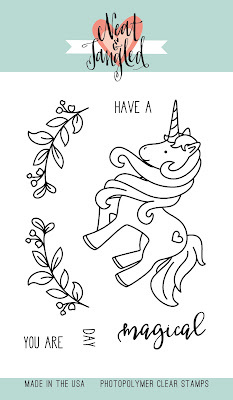 I hope you like this magical unicorn! 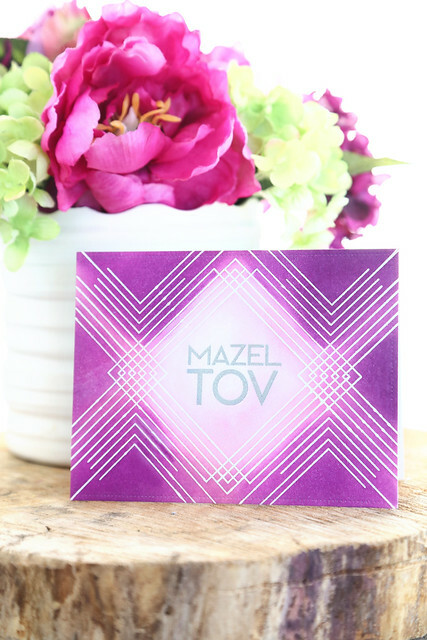 Don't forget to leave a comment to be in the running for a 25$ gift card to the Neat and Tangled store, and check out the NT blog for a chance to win your own Magical Day stamp set.